We’re finally heading towards the highlight of our trip – the speck of a town called Gujo Hachiman. It is exactly as British writer Alan Booth had described in his book Looking For The Lost, ‘The lanes…are narrow, steeply walled, and end in dimly lanterned eating places or in small stone bridges that arch over splashing streams.’ Picturesquely set at the confluence of the Nagara, Kodara and Yoshida Rivers, water dominates Gujo Hachiman’s landscape, architecture, and town life. This obscure hamlet is also home to one of the 3 most important traditional dance festivals in Japan, the Gujo Odori. The event, designated as Significant Intangible Cultural Folk Asset by the Japanese government, is celebrated over 31 glorious days. The calendar spans July to September, as some days are ‘dark’, with the festival going into hyperdrive for 4 days in mid-August during Obon when participants dance from 8 pm till 4-5 am the next morning! With few foreign tourists, the festival feels truly authentic – in fact, so many of the town folks turned out for the event that we kept running into them during the rest of our stay! 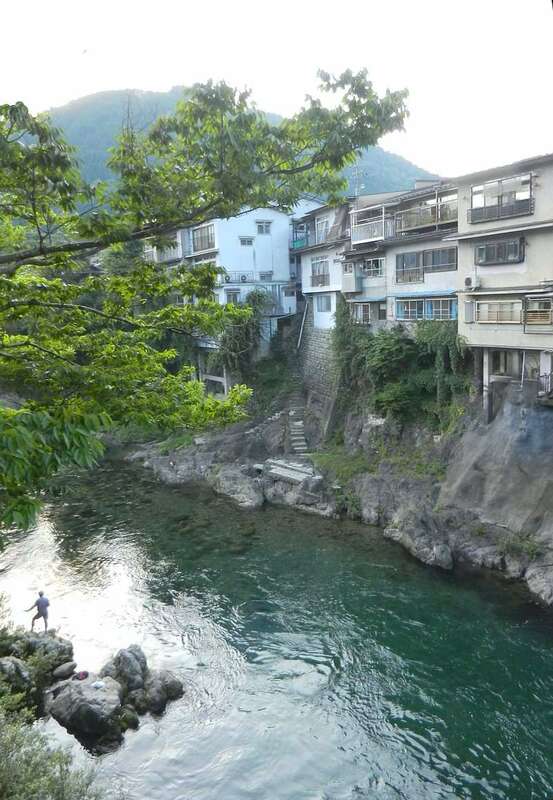 Houses clinging on the sides of the river have stairs down to the water for fishing, cooking, and cleaning. 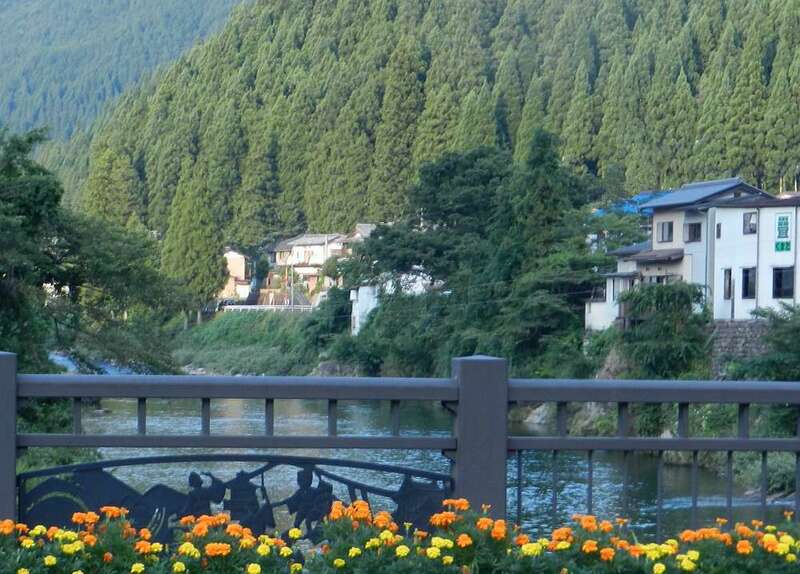 During the ayu (sweetfish) fishing season, the banks are usually thick with anglers vying to catch the prized fish. But the ranks thin out by sunset, leaving a lone fisherman to his vigil. 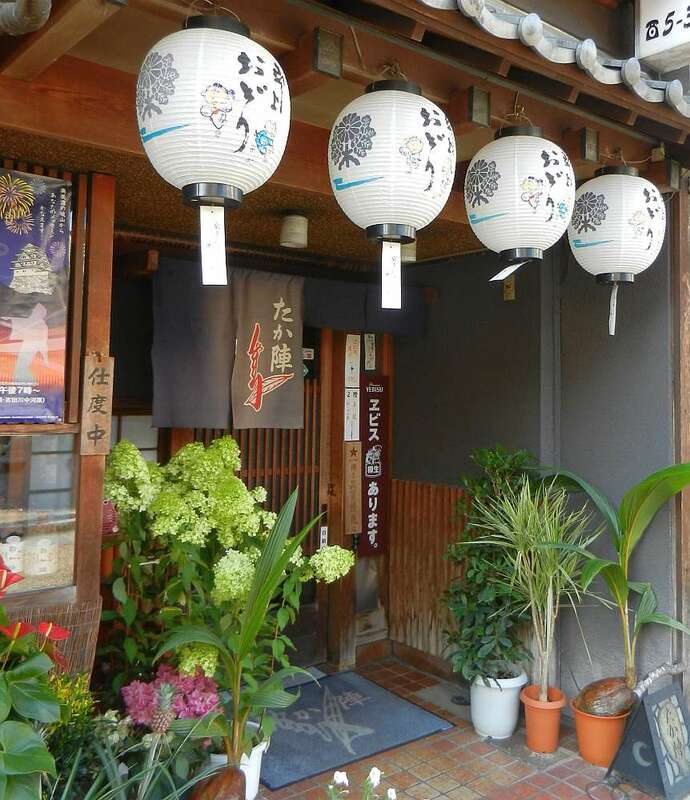 We were set on having the fabled Hida-gyu for dinner on the day of our arrival. Unfortunately it wasn’t an Odori day and some of the most popular restaurants took the day off. 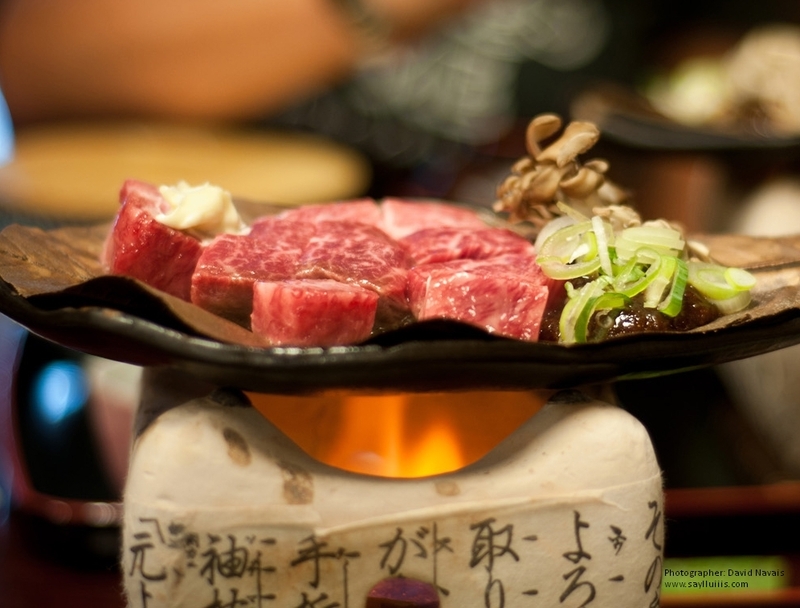 The prize – Hida beef for dinner!! Just when we thought all was lost, the receptionist at our ryokan asked his English teacher to help with our quest. She graciously came over, called around on our behalf, took us to the restaurant to check it out, and then made dinner reservation for our group. Such hospitality is typical in Japan, but still much more than what we expected! That night, we sampled different beef preparations from the menu. Everyone ordered the food prepared from the kitchen while I, ever on the lookout for an active dining experience, opted to grill my own dinner. It was everything I had hoped for – well marbled, incredibly flavorful and melt-in-the-mouth tender. It’s not cheap, but a totally worthwhile experience. Apparently USDA has finally lifted the ban on Japanese beef, but the tab is about $350 per slab o’ Kobe steak at upscale eateries. Time to plan another visit to Japan and ‘import’ a few kilos in my suitcase. That will help pay for my trip and then some!! A series of lanterns outside a house. The day was finally cooling off (yes, the heat wave followed us here…) so we took a stroll after dinner to work off the food. Gujo Hachiman shuts down early, so though we could hear an occasional murmur from residents in the dark, we had the place practically to ourselves by 10 pm. There were lanterns galore: from those bearing owners’ names placed strategically outside the premises, to traditional paper lanterns strung across major streets or shrines, and quaint street lamps glowing at regular intervals on the bridges. They are all part of the town’s charm. Railing decorated with Gujo Odori dance figures and the Castle. After breakfast the next day, we went on a self guided tour of the town. The expansive view over the Nagara River is framed by metal railing that depicts signature Gujo Odori dance poses as well as local landmarks. Mizubune in one of the main streets. You can find this eco-friendly water management system all over town. 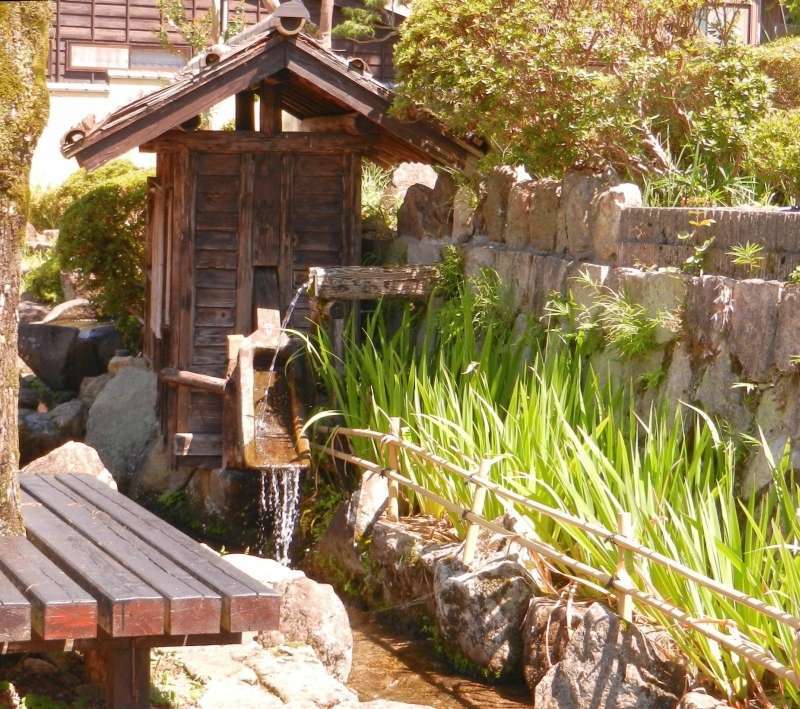 Mizubune can be 2 or 3 tiered wood or stone basins, with water flowing from the top into the lower ones. There are strict rules on water usage. The top basin is for drinking, the second tier for washing vegetables, and the lowest one for doing dishes. I counted 4 basins here – this must be mizubune on steroids! A shrine we found following a self-guided tour from the town’s official website. Gujo Hachiman is home to a surprising number of temples and shrines – 17 in all, earning it the moniker of ‘Little Kyoto’. These buildings all date back to the late 1600’s after a fire razed the town. 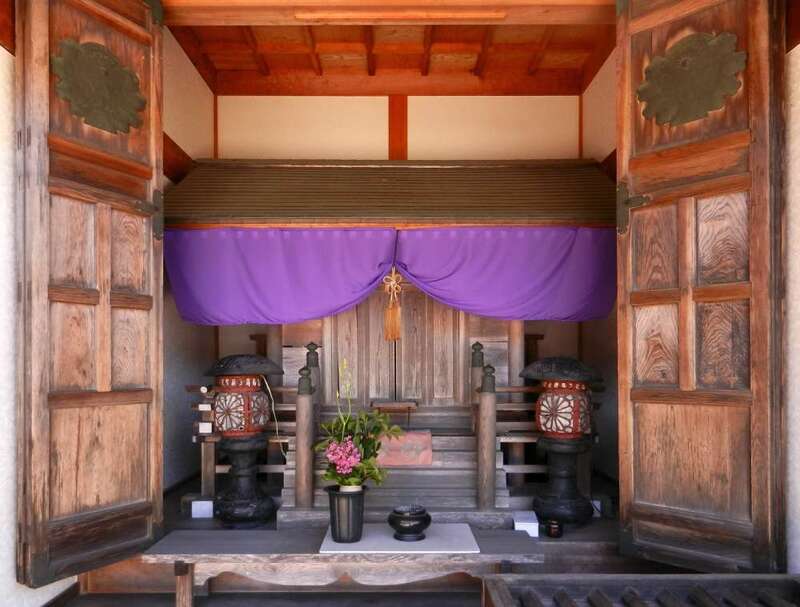 Though we lost track of where we went, the purple drape and simple floral offering at this shrine is an elegant standout. 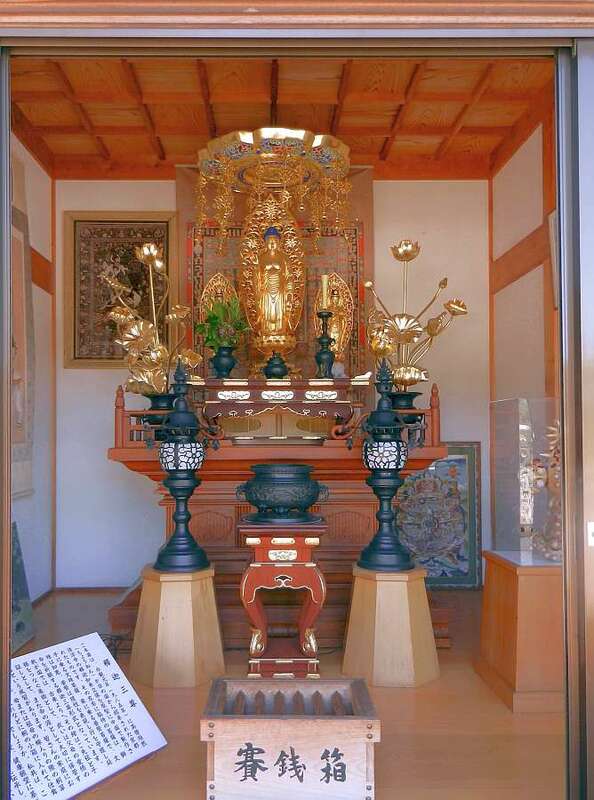 In the same complex is this glitzy room with a gilded Buddha flanked by fancy altar pieces. Of course, considering the alms box is also here, maybe it’s just savvy marketing? Simple but evocative carvings with cloud motif on temple brackets. 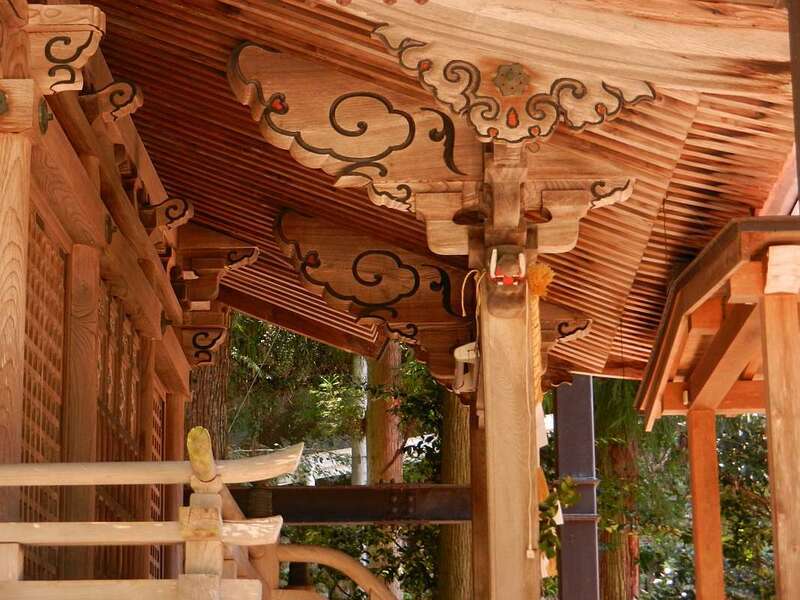 The temple’s wood construction characterizes the raw & natural beauty of wabi-sabi. I’m constantly reminded of the striking differences in taste between Japan and China, where the former celebrates the Miesian mantra of ‘less is more’, while the latter embraces the idea of ‘more is more…better! 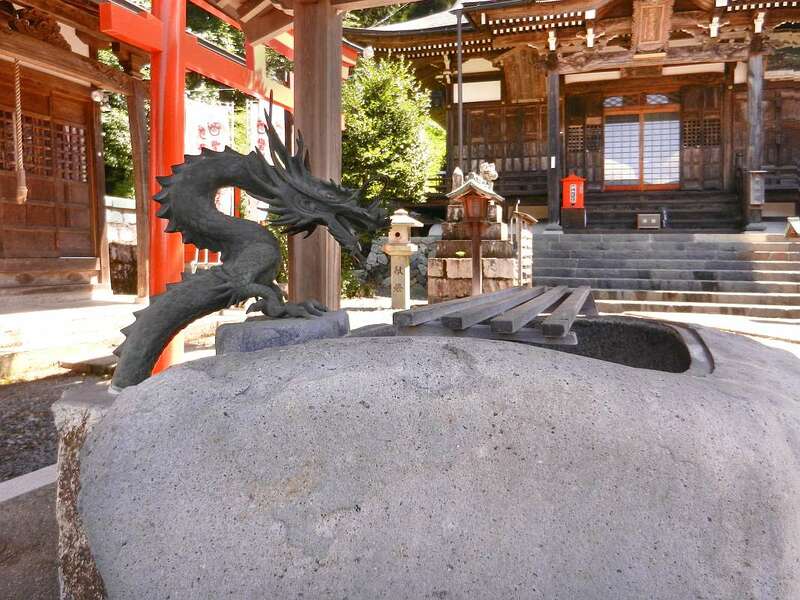 Dragon fountain at Gochikuin Temple. There are a couple of dragon fountains on the temple grounds, but this one is more impressive because of its size, elaborate details and prominent location. Water feature on Yanagi Machi (Willow Street). After the devastating fire of 1667, the town was rebuilt with a network of waterways from the surrounding rivers for minimize fire hazards. Water is ever pervasive: in fountains for drinking, by platforms and basins for daily washing of food or clothing, and as decorative elements around town. 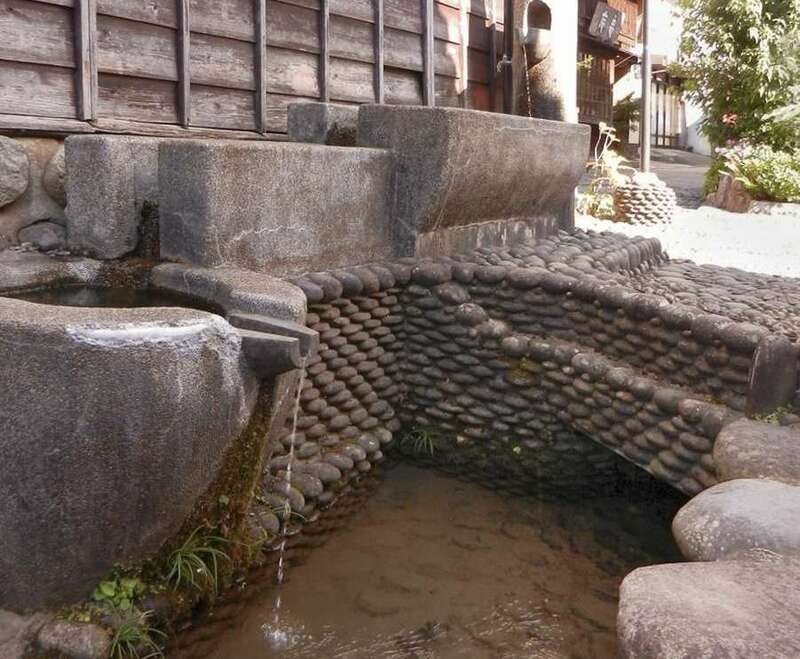 The above water trough on Yanagi Machi is fed by a chute on its side. Once full, the trough tips over to dump water into the canal, and the cycle repeats. We were at the Hakurankan museum and caught live demos of some of the ten Gujo Odori dances. They opened with the most popular number, the Kawasaki. Watch the video carefully and you’ll see a Kawasaki dance move depicted in the railing shown earlier. Can you find elements in the dance that represent the rivers and mountains of Gujo Hachiman, or moon viewing on a warm summer evening? It’s kind of like the hula but timed to the beat of tapping getas! Called the Harukoma, it is my favorite dance – you can get a good workout with this! 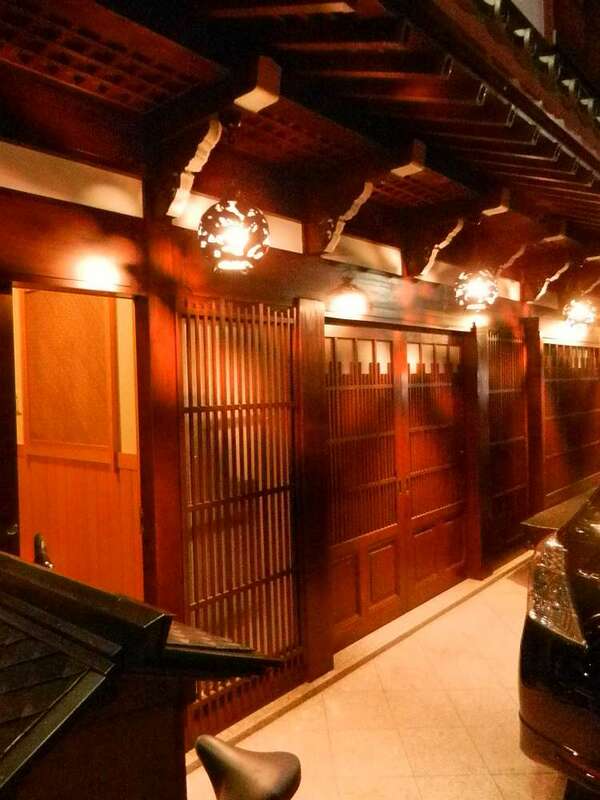 Apparently in Edo times, Gujo Hachiman was famous for its horse farms and did a brisk trade with the samurai. This dance captures the movements of a samurai riding a spirited yearling. The Gengen Balabala differs from other Gujo Odori dances in that it moves counter-clockwise and is only accompanied by the singer and a drum. This dance portrays the flowing long sleeves of a young girl’s kimono over her arm as she plays a ball game. The dance Neko-No-Ko literally means kitten. Watch and you’ll see why. The town used to be an important silk producer and cats were used to protect the valuable silk worms. This dance mimics the motions of a kitten washing its face with its paws – it’s really quite a fun dance! This entry was posted in Architecture, Food, Travel and tagged Gengen Balabala odori, Gujo Hachiman, Gujo Odori, Harukoma odori, Hida beef, Kawasaki odori, Mizubune, Neko-No-Ko odori by Marie Chan. Bookmark the permalink.